← Cancer Lesson #60: One in eight women will get breast cancer. Oshkosh ~ where Japanese airplanes taxi by you while you’re riding on a tram. Oshkosh ~ where Japanese airplanes taxi by you while you’re riding on a tram., a photo by ladywriter47 on Flickr. 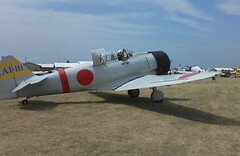 1 Response to Oshkosh ~ where Japanese airplanes taxi by you while you’re riding on a tram.